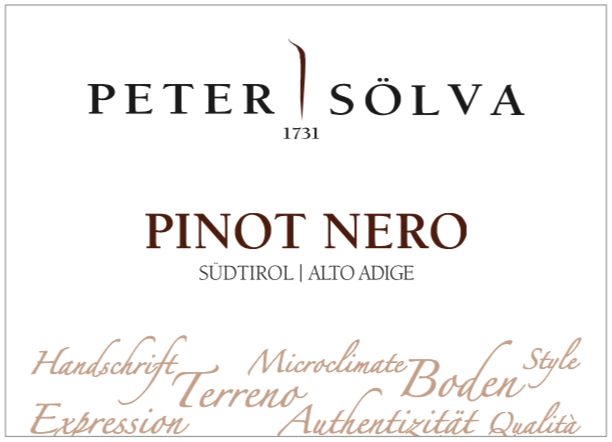 Pinot Nero DOC by Peter Sölva & Söhne has a classic fermentation in large wooden barrels. Medium ruby red color with garnet glow. clean aroma with hints of raspberry, cherry and spices. Fruity, sweet flavor, medium body and elegant style. It goes well with roasts, game and aged cheeses. THE WINE Our Goal is to work just with a selected quality of autochthonous varieties like Schiava, Lagrein, Gewürztraminer and also with Pinot Noir to show the typical taste of these varieties from this special area in the south of our region. Taste these varieties from our selected vineyards! Classic fermentation in large wood casks. Medium ruby color with a garnet shimmer. Clean aroma with notes of raspberries, cherries and diverse spices. 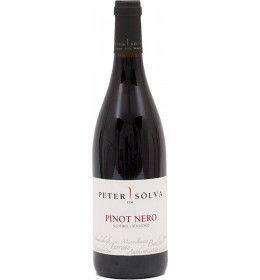 Fruity, mild flavour, medium-bodied and elegant style. THE COMPANY The Peter Sölva & Söhne winery is one of the oldest wine-growing businesses in Caldero. We are a family business which has been passed on from father to son for hundreds of years. Documents go back to 1731 showing that our family has grown grapes, made and sold wine without a break for 10 generations. One of our many wine customers, which our family has acquired through our attention to quality, is the St. Peter Monastery in Salzburg. Numerous awards during the course of our history confirm our philosophy. Of particular note is, for example, in 1908 when our wine cellars received the prize of the German Alto Adige Association for Agricultural Businesses at the 12th German Alto Adige Wine Market in Bolzano. Up to 1960 we particularly produced open wines and sold them in 50-litre wooden casks to caterers in Alto Adige and Munich. It was not until several years after the second world war that we started to bottle the wine in litre bottles and then more and more in 0.75 bottles. Over the years positive advancements have been made in wine-growing and in the cellar economy. In 1963 the so-called indication of origin was established in order to better control cultivation and quality. For example, cultivation with a wire frame became another interesting cultivating system. In 1985 we experimented for the first time with this cultivating system. New challenges in wine-growing were sought many new varieties, such as Merlot, Sauvignon blanc, Cabernet Franc and Cabernet Sauvignon were planted in addition to the traditional varieties such as, in particular, Vernatsch, Lagrein and Gewürztraminer. Also, the cellar techniques could be simplified and modernized in order to process the grape quality more selectively and in particular more carefully. In 1986 we began to use barrique casts as well as our stainless steel tanks and our large wooden casks. In more recent years we have worked on the quality and names of our wine range. Many ideas - in particular our family history gave us the historical family names: AMISTAR (Sign - identification mark of the family, Spätlese) and DESILVA (Sign - identification mark of the ground, old vines). With these two family names we not only identify ourselves personally with our wines, but also as a historical wine-growing family. This family tradition was, of course, important enough for us to continue maintaining the local varieties and also to look innovatively into the future. In particular, keeping in touch with our loyal customers helped us with our decision to always produce the right wines. Of course, our customers requirements have changed considerably, so that it has become even more of a challenge to always work with the our genuine grounds and our region, which reflects itself in our identification mark, because that is what will also make us different in the future. *Wine growing area - 12 hectares. Before 28,57 € tax incl. Tasting Color - ruby red with garnet Perfume - Intense fruity aromas of black cherry, wild berries and ripe cherries. Taste - Elegant and persistent. Great. Our Goal is to work just with a selected quality of autochthonous varieties like Schiava, Lagrein, Gewürztraminer and also with Pinot Noir to show the typical taste of these varieties from this special area in the south of our region. Taste these varieties from our selected vineyards! Classic fermentation in large wood casks. Medium ruby color with a garnet shimmer. Clean aroma with notes of raspberries, cherries and diverse spices. 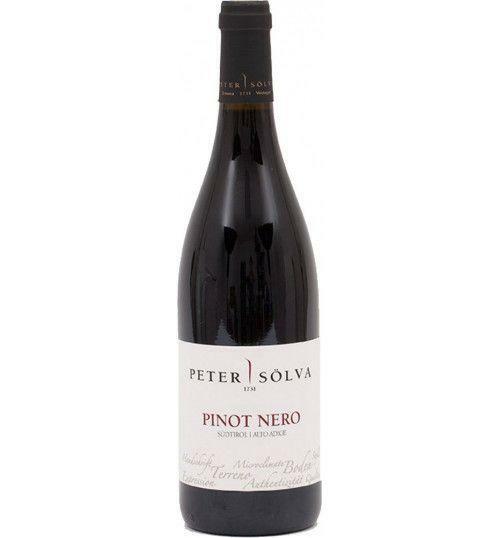 Fruity, mild flavour, medium-bodied and elegant style. The Peter Sölva & Söhne winery is one of the oldest wine-growing businesses in Caldero. We are a family business which has been passed on from father to son for hundreds of years. Documents go back to 1731 showing that our family has grown grapes, made and sold wine without a break for 10 generations. One of our many wine customers, which our family has acquired through our attention to quality, is the St. Peter Monastery in Salzburg. Numerous awards during the course of our history confirm our philosophy. Of particular note is, for example, in 1908 when our wine cellars received the prize of the German Alto Adige Association for Agricultural Businesses at the 12th German Alto Adige Wine Market in Bolzano. Up to 1960 we particularly produced open wines and sold them in 50-litre wooden casks to caterers in Alto Adige and Munich. 1963 the so-called indication of origin was established in order to better control cultivation and quality. For example, cultivation with a wire frame became another interesting cultivating system. In 1985 we experimented for the first time with this cultivating system. New challenges in wine-growing were sought many new varieties, such as Merlot, Sauvignon blanc, Cabernet Franc and Cabernet Sauvignon were planted in addition to the traditional varieties such as, in particular, Vernatsch, Lagrein and Gewürztraminer. Also, the cellar techniques could be simplified and modernized in order to process the grape quality more selectively and in particular more carefully. In 1986 we began to use barrique casts as well as our stainless steel tanks and our large wooden casks. In more recent years we have worked on the quality and names of our wine range. Many ideas - in particular our family history gave us the historical family names: AMISTAR (Sign - identification mark of the family, Spätlese) and DESILVA (Sign - identification mark of the ground, old vines). With these two family names we not only identify ourselves personally with our wines, but also as a historical wine-growing family. This family tradition was, of course, important enough for us to continue maintaining the local varieties and also to look innovatively into the future. In particular, keeping in touch with our loyal customers helped us with our decision to always produce the right wines. Of course, our customers requirements have changed considerably, so that it has become even more of a challenge to always work with the our genuine grounds and our region, which reflects itself in our identification mark, because that is what will also make us different in the future. *Wine growing area - 12 hectares.